Robert Brownjohn was an American graphic designer best known for his film title sequences, especially From Russia with Love and Goldfinger. In 1944, at age 19, Robert was accepted into the Institute of Design in Chicago, where he became a protégé of founder László Moholy-Nagy. Upon graduation, he worked as an architectural planner and then taught at the Institute of Design. 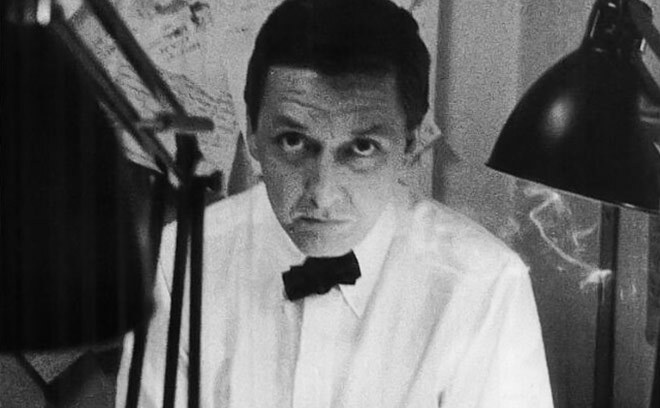 After five years, he moved to New York to pursue a career in graphic design and in 1957, he founded Brownjohn, Chermayeff & Geismar (BCG) with fellow designers Ivan Chermayeff and Tom Geismar, who designed mainly for print, producing commercial projects as well as typographic experiments for clients as large as Pepsi-Cola. In 1959, BCG came to an end as Robert moved to the UK, where he worked at advertising agency J. Walter Thompson until 1962, when he moved over to McCann Erickson. It was at this point that his career began to shift toward moving images and in 1963, the producers of the James Bond films approached him to design the title sequence for the second Bond film, From Russia with Love. He also later designed the titles and promotional posters for Goldfinger. Both titles used the technique of projecting moving footage onto the bodies of models and filming the results, which is an idea gleaned from the Bauhaus and was used by László Maholy-Nagy in his early 1920s constructivist films. He went on to design the cover for the 1969 Rolling Stones album Let It Bleed as well as two other title sequences: Where the Spies Are and The Night of the Generals.